IIT Bombay, December 11-13, 2019. IIIT Hyderabad, December 6-8 2018. Amrita School of Engineering, Amritapuri campus, February 26-28, 2018. Amrita University, Coimbatore Campus, August 14-19, 2017. Chennai Mathematical Institute, January 30-February 3, 2017. TIFR, Mumbai, December 4-10 2016. Chennai Mathematical Institute, February 9-13, 2015. New Delhi, December 15-17 2014. Chennai Mathematical Institute, January 9-10 2013. Chennai Mathematical Institute, July 19-21 2012. VIT Vellore, July 12-14 2011. Chennai Mathematical Institute, January 27-29, 2011. DA-IICT, Gandhinagar, July 15-17 2010. Chennai Mathematical Institute, February 1-3, 2010. TRDDC Pune, January 4-10 2010. IIT Roorkee, July 13-15 2009. Chennai Mathematical Institute, January 29-31 2009. This page is dedicated to activities in the area of Formal Methods being undertaken in India. 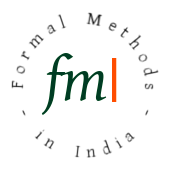 Subscribe to the FMIndia mailing list. The scope of this page is rather broad ranging from highly theoretical work on logics and models of programs to practical notations, methods and tools for program analysis as well as case studies in using formal methods. If you use/work on Formal Methods and are in India, we suggest that you subscribe to our mailing list. To contribute to this site, please contact madhavan [at] cmi (dot) ac (dot) in. And, please include " [FMI] " in the subject line. This page is being maintained by Madhavan Mukund.